Specially Formulated for Birdbaths Inhabited by Birds, Small Fish, Frogs, etc. Prevents organic and inorganic contaminants from forming (i.e. crusty white scale deposits, iron, copper and hard water stains). 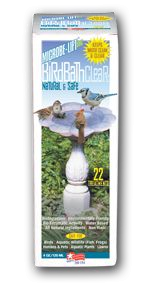 One system helps to prevent the buildup of stains and mineral deposits on the birdbath or fountain surface. The second system uses bio-enzymatic activity to keep water clear and free from the organic debris that can make the water cloudy. 4 oz. (10BBC4) for 17 treatments.